Lifelong Cincinnatians will tell you how they like their chili -- and which chili is their favorite. 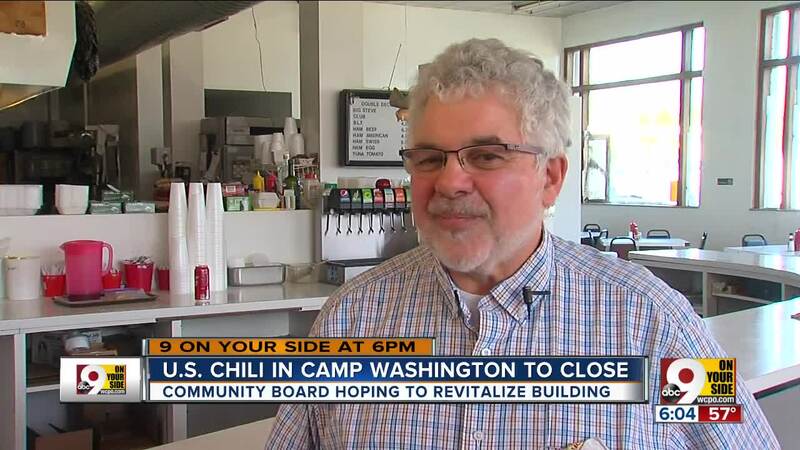 Camp Washington has been home to two well-known chili parlors for at least 35 years. James "Jimmy" Storgion grew up in the chili business. He remembers working with his family at Camp Washington Chili when he was a little boy. "Nine years old I was washing dishes over in Camp," Storgion said. "By 14, I was allowed to work the front. I had to have an A in math to run the register." Since 1984, he has been the owner of U.S. Chili across the street from Camp Washington Chili at Colerain Avenue and Hopple Street. "Well, this is my life. I'm here every day," he said with 20 gallons of simmering chili cooking in the kitchen. But, in a few months, there will be just one chili parlor on that Camp Washington corner. "The building is being sold," he said. Yesterday, the old building built in 1895 was sold to the Camp Washington Community Board, a neighborhood community development corporation, and the Camp Washington Business Association. Storgion said while he owned the chili parlor, his father owned the building. "It's time. 35 years, it's time," Storgion said. Storgion is the third generation in his family to be in the chili business. He said he still uses his grandfather's recipe. "He was the original Camp Washington Chili. His name was Steve Andon," Storgion said. He recalled his grandfather was so popular everyone called him Uncle Steve. Years after his father bought the old building across the street, he told his son to open up a restaurant there. "I need a tenant," his father told him. Storgion said he named it U.S. Chili as an homage to his grandfather. The U.S. actually stands for Uncle Steve. Before becoming U.S. Chili, the building had been a hotel for railroad workers who stayed on the top three floors and a bank. In fact, the vault door is still there. But, now there's a bathroom on the other side. The Camp Washington Community Board and Camp Washington Business Association want to redevelop the building as a mixed use property. "We're looking at studio apartments on the second, third and fourth floor for sure," said Joseph Gorman, president and CEO for the Camp Washington Community Board. He said the building is in a prime location. "UC, all the hospitals, 55,000 people work there a day," Gorman said. "Downtown is only three miles away. That's the largest employment district." "It's a gateway," said James Heller-Jackson, executive director of the Camp Washington Business Association. "It's a very important building for Camp Washington. It sits square at the corner of Colerain and Hopple." The community organizations are working together on revitalization plans for the building. In addition to turning the top floors into living space, they want the bottom space to remain a restaurant. "We've got a busy corner," Heller-Jackson said. "It's very busy all the time. It would make an incredible location for another restaurant." Also, because of the turn of the 20th century architecture of the building, they may apply for a historical designation for either the building alone or several buildings to create a historic district. "That kind of change we will seriously have some opposition to that," Gorman said. "People have certain thoughts about being in a historic district and how hard that is." But no decisions have been made yet. Meanwhile, Storgion is putting to rest rumors that there was a family feud with Camp Washington Chili. "No, no," he said. "John's my second cousin. He's been to my wedding. I've been to his daughter's wedding." He has some ideas about what he'll do next. "I might just go to work for somebody," he joked. "Buy me some free time,"
Storgion may look for ways to keep the chili flowing. But, it won't be from the corner of Colerain and Hopple. The doors will close in 90 days. "Sort of like graduating high school," he said. "You don't know where you're going but you're happy and sad at the same time."